The pretty, feminine look of theses open knit style Elle Dainty and Delicate Soft Pelerine Anklets gives these cotton rich socks a delicate appearance. The lacy pelerine stitch pattern has a floral motif that is timeless in its gentle appeal. 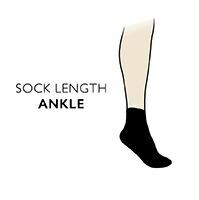 The distinctive open knit makes the socks very breathable, without the tightness that denser weaves have. These Elle Dainty and Delicate Soft Pelerine Anklets come in a twin pack, made with narrow, elasticated upper cuffs and smooth soles for added comfort.